Clio & Phineas: Self Drafted Pencil Skirt Muslin of Triumph!! I may be getting a little bit ahead of myself since I don't have a finished skirt yet. But my mojo and my Better Judgement have been high fiving each other and doing a happy dance for the last few days over this collaboration. 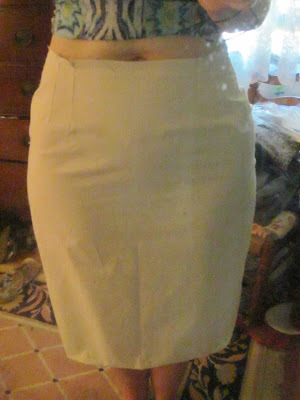 It's muslin 1.0 of my self drafted pencil skirt with no alterations. I normally try to avoid muslin photos because I think you can drive yourself crazy trying to eradicate every slight wrinkle, pucker and shadow that the camera accentuates. But because this muslin fits so much better on the first baste than just about anything I've sewn out of an envelope before, well.... it's happy dance time! Seriously, my Better Judgement is blasting How Ya Like Me Now and acting uncharacteristically smug. As a reminder, I used Kenneth Kings "The Skirts" CD book to draft the sloper. I'll do a review when I have a finished skirt. From the sloper I added seam allowances and was off and running. In this first version, the high hip needs a little reshaping to get rid of the elephant ears and the thighs need a bit more ease. So, I made those changes and did a second try on. Bingo! Things were nearly perfect. I don't know about you, but I write on my muslins so that when I go to make changes to the pattern, I know exactly where and how much. 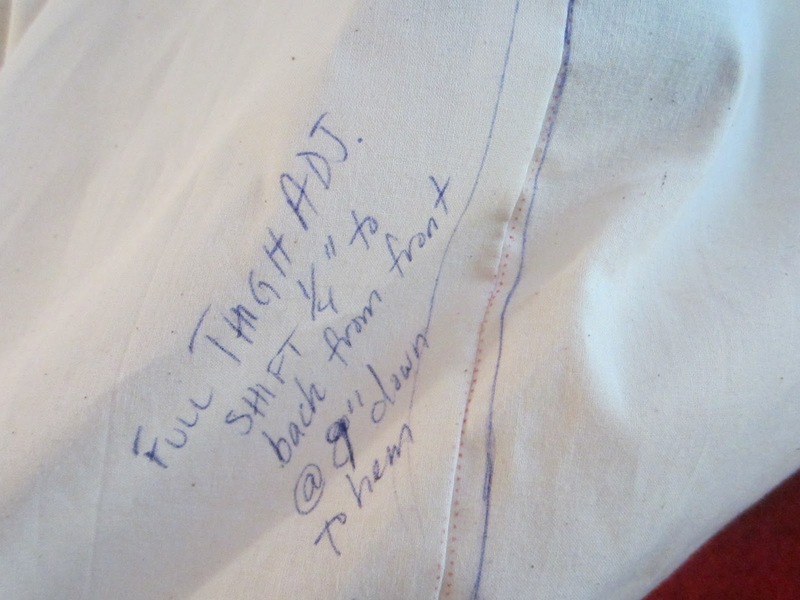 I transferred all the changes back to my sloper pattern plus one addition. My thighs pull the seams a little toward the front. So, I transferred a little from the back to the front to make the seam perpendicular to the floor. This should have said "from back to front". But I still made the adjustment correctly. Anyway, at this point, I'm pretty thrilled with the results. I even impulsively bought more fabric to sew another pencil skirt after I finish the wax cloth version, which will be cut shortly. My mind is all lit up with the possible variations I could make. Anyway, I've decided to take extra time off for the Labor Day weekend. So, there will be lots of sewing, I hope. Stay tuned! That looks really good. I have given up trying to draft a skirt pattern for myself. I need professional help so i intend registering on a pattern drafting course next year. Wow, this looks so great! Can't wait to see the wax cloth version! I bet the finished version is going to look awesome! Can't wait to see it in your wax cloth. Oh, and I totally write on my muslins all the time. Definitely helps to see where and how much things need to be taken it, let out, raised or lowered. Much easier to mark it with a sharpie then measure and transfer to the pattern than it is to try and pin things and remember what they all meant when you take it off. Looks like a real winner to me Clio. 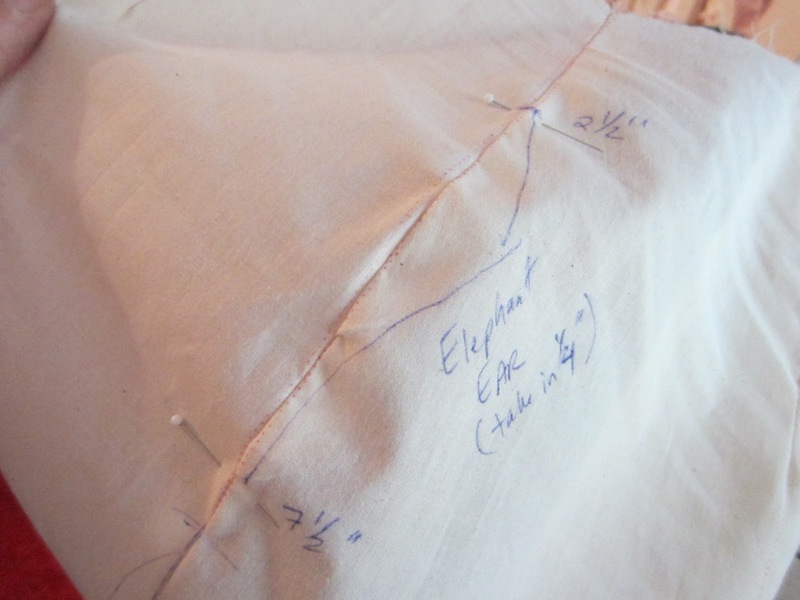 BTW check out smokingneedles blog, she posted a narrow hem video tutorial just a couple of days ago. It was very helpful. Nothing better than a good fitting muslin, especially as it means you know you can dive into the real sewing without a hitch! It looks great! I love the term 'elephant ears' - first time I've heard it too. hehe! THANKS Faye!! Yeah, I was totally defeated by the narrow hemmer! Exactly - pins never quite work for me. Half the time one falls out and then I have to go back and re-try on. Such a hassle! Thanks! I took a pants drafting class a few years ago. At the time, I was too new to really understand and effectively used my block, but it taught me some good drafting skills. So, I hope it goes really well for you! Looks really great! You'll get so much use out of a well-fitting sloper. Have a great weekend! The fit is incredible! What a revelation to have such a well-fitting sloper right off the bat. You can make a million of these. Beautiful finished product! Heck yes, I write on my muslins. I like to use a permanent marker, but pencil will do in a pinch. Natural fibers tend to bleed the ink, so write big.